CGS Motorsports air intake and cat-back exhaust systems together maximize the performance of your vehicle. Don't just reveal half of your vehicles potential when you could have it all. By adding CGS complete line of aftermarket products you will be doing just that. Together, our performance systems maximize your engine's breathing by fully enhancing the air intake and exhaust flow, delivering the full capability of your vehicle. Each system is tested, tried and guaranteed to increase horsepower and torque. CGS recommends that you LET IT BREATHE. Truck magazine just shot our 2018 Ford Expedition for the cover of Truckin. Be on the look out for it on a news stand near you. ...see it here! Car show season is just around the corner. 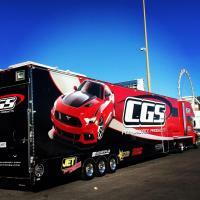 Be sure to look out for the CGS big rig at a show near you. Stop by and say hi. Have a vehicle with CGS products installed? We want to see it! Send in your picture. If your ride is chosen you will receive a free CGS Pinstripe T-shirt! ...send it here!